Optimizing Me: SI: Do you have it? SI: Do you have it? Since my power was out (again!) half the day yesterday, I decided to make time for some self-care after putting my son to bed. I lit a bunch of candles and curled up to re-read a book that has been life-changing for me, It Starts with Food, by Dallas & Melissa Hartwig. If the authors or name of the book sound familiar, it's because the Hartwigs developed the Whole30 program. I enjoyed reading this book again and wanted to write about a topic they cover that may or may not be that familiar you. Basically, anything that doesn't belong in our bodies is seen as a threat to our immune system. Some foods have the ability to sneak out of our digestive tract and into our bodies, which confuse our immune cells, which then release antibodies, causing our immune system to dysfunction, and typically resulting in "food sensitivities or allergies, systemic inflammation, and possibly an autoimmune condition." Wow. Sometimes our bodies have to "put off" healing something like tendonitis in order to take care of other "tasks" because our immune system is overloaded, often due to our food choices. 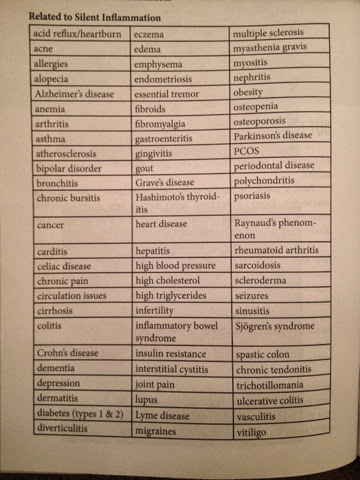 So... the good news, is that even years of systemic inflammation and most health consequences are highly reversible. Positive change can start this week and even today! It's as simple as the Hartwigs said: "Change the food you put on your plate." 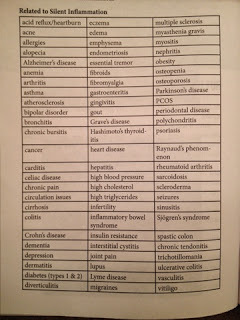 Alright, so what are these foods that are known to cause systemic inflammation? Sugar, Sweeteners & Alcohol - Artificial & natural sugars like syrup, agave, honey, etc. are included under sweeteners but whole fruits are definitely okay! Dairy - Some people can tolerate quality sources of it but it's difficult to know until you've removed it for 3 weeks or so and then reintroduce it. So there you have it, systemic inflammation in a nut-shell. This is barely scratching the surface but will hopefully provide some insight on chronic problems you may be dealing with and give you something to try to improve your quality of life!